Police said workers with Lucas Tree Experts mistook Michael Smith’s tattoo for a real gun when he appeared outside shirtless Tuesday morning. NORRIDGEWOCK — Michael Smith went outside shirtless after being awakened Tuesday morning, yelling at a tree removal company to get off his property. The workers thought they saw a gun in his waistband and called police. Staff photo by David LeamingCLOSE CALL: Norridgewock resident Michael Smith stands beside a Somerset County sheriff’s deputy Tuesday morning. 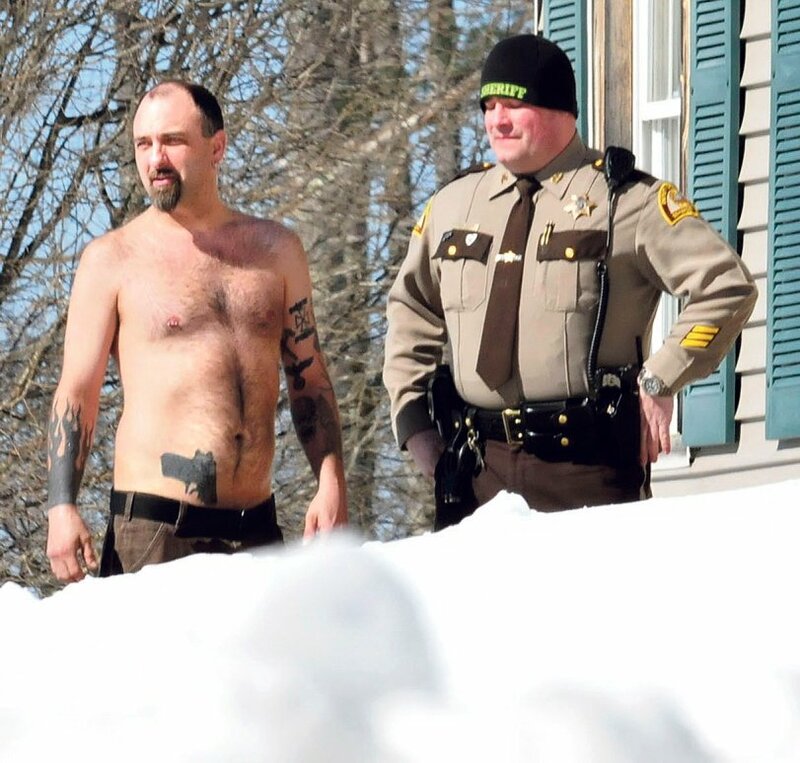 The tattoo of a pistol on his stomach was mistaken for a real firearm by employees of Lucas Tree Experts after, according to Smith, workers woke him up while they were cutting wood for Central Maine Power Co. The workers called police. Staff photo by David LeamingARMED: Trooper Scott Duff points his rifle toward the home of Michael Smith on Tuesday morning as other police call for Smith to come out of the home in Norridgewock. Tree workers called police earlier after they mistook a pistol tattoo on Smith’s stomach for a real firearm. Smith, who’d gone back to bed, was awakened again minutes later — this time by Maine State Police at his front door, backed up by a group of troopers with assault rifles in his driveway. They were asking him via a megaphone to come out of his house. Smith did have a gun. It was tattooed on his stomach. No charges will be filed against Smith, but police said they always take reports of a gun or threat seriously. Several police standoffs with armed men have occurred in central Maine in recent years, some of them deadly. Smith was asleep at his home on Ray Nors Drive, a dead-end road off Ward Hill Road, about 10 a.m. Tuesday when he heard a loud noise outside his window. He said it sounded as though someone was driving up his driveway and crunching the thick layer of ice on it. Smith, who works nights, said he was still asleep and was surprised to see a crew of workers from Lucas Tree Experts preparing to saw a number of trees around some power lines on his property. Wearing just a pair of pants and no shirt, though the temperature was in the teens, he went outside and asked them to leave. The tree removal company workers reported that as they backed into the driveway, Smith told them not to cut the trees. They told him it was not a problem. Smith went back to bed; but as the workers were leaving, one thought he saw a pistol in Smith’s waistband. That’s when they called the police, momentarily prompting reports of a police standoff. It was all just a misunderstanding, both Smith and police said. “I got plans today. I didn’t want to get shot,” Smith said shortly after the scene was cleared by police. Duff said he doesn’t think Smith went outside with his shirt off deliberately or to make it appear as though he had a gun and scare the workers. The tattoo of the life-size handgun is positioned on Smith’s body to look as if the barrel of the gun is tucked into the waist of his pants. He said he doesn’t regret getting it, even though this isn’t the first time the tattoo has been the focus of police attention. He was arrested on a warrant for an unpaid fine once, and the officer asked if he had any weapons. “I said, âYeah, I got this gun on me all the time. It’s tattooed on,'” Smith said. Central Maine Power Co., which contracts Lucas Tree Experts for a large portion of the tree trimming work it does around power lines, does not comment on interactions involving customers, spokeswoman Gail Rice said. Lucas Tree Experts did not return a request for comment Tuesday. Rice said that, in general, if a customer is unhappy with the work being done, tree crews are supposed to stop work, leave the area and call CMP. State law says that because such work is necessary to ensure the quality of electric service, the company is not required to give notice to customers. However, customers can ask to be placed on a list for advance notification before trimming, she said. 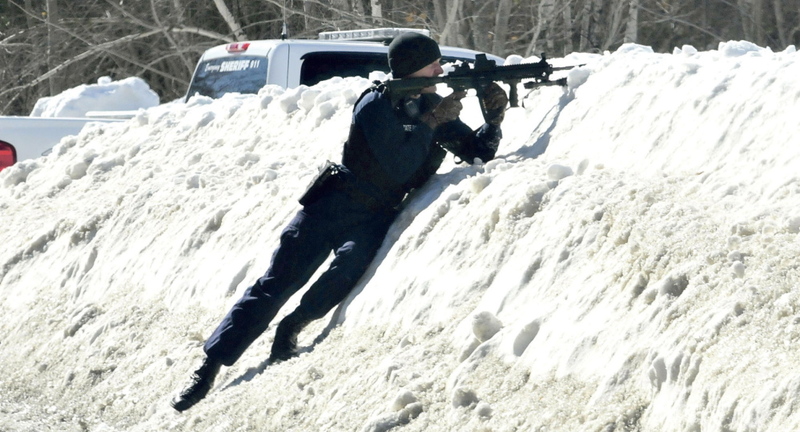 Most police standoffs in central Maine, even when the person has a real gun, end peacefully. One notable example occurred on Dec. 24, 2012, when Skowhegan police managed to subdue John Emery, Fairfield police chief at the time, after a chase of several hours and a standoff. Emery, who later said a combination of stress and alcohol pushed him over the edge, fired a shot at officers before he was subdued. There have been several standoffs in the past several years in central Maine that have ended only when police shot the person with the weapon, sometimes fatally. In December 2007, Jason Wentzell, 28, who was suicidal, was shot and killed by a Gardiner police officer and a state trooper on Route 24, where he was holding his estranged wife and family hostage in a car. In February 2008, Daniel McDowell, 21, who was drunk and had a history of suicide attempts, was shot fatally by state police and Somerset County sheriff’s deputies in a confrontation in Harmony. There were two in 2010. In July that year, James Popkowski, 37, a distraught and disabled veteran of the Afghanistan war, was shot fatally by a Maine warden outside the Togus veterans hospital. In October, Kemp Lybrook, 29, who was despondent and had threatened to commit “suicide by cop,” was shot and wounded by a state police detective during a standoff outside his home in Skowhegan. In September 2011, Paul Fritze, 41, who was mentally ill and had stopped taking his medication, was shot to death by a state trooper after pointing a handgun at a state police tactical team vehicle parked in the driveway of his home in Farmingdale. In November 2011, Justin Crowley-Smilek, 28, an Army veteran who had post-traumatic stress disorder, was shot and killed outside the Farmington Police Department by a Farmington police officer. In June 2012, Charles Robinson, 75, who was drunk and had a history of alcohol abuse, was shot to death by border patrol agents at his home in Jackman.